Being a mom is challenging. Sometimes I don't know how we pull it all off. My hubby has literally been working 24/7 this spring, leaving me with with half the support and two kids who miss their daddy endlessly. I will never take my better half for granted after this stretch. In light of my current predicament, simple -- and I mean really simple -- has been the name of the game for me at mealtime. I feel like I'm juggling more and more these days, so I try to pack as many healthy foods as I can into every meal. Since I usually keep cooked quinoa in the fridge and used my speedy mandolin slicer, I was able to whip up this nutritious salad in minutes. With Mother's Day approaching this light spring salad is perfect for taking things down a notch for mom and celebrating simple meals that go from dinner to the lunch box with ease. 1. In a bowl, combine the quinoa, radishes, cucumbers and tomatoes. 2. In a small bowl, whisk together the oil, lemon juice and salt. I like this idea for Mother's Day!!! I do not know why my comment was not approved in the lobster rolls. But I hope this time my comment will get through and get approved. 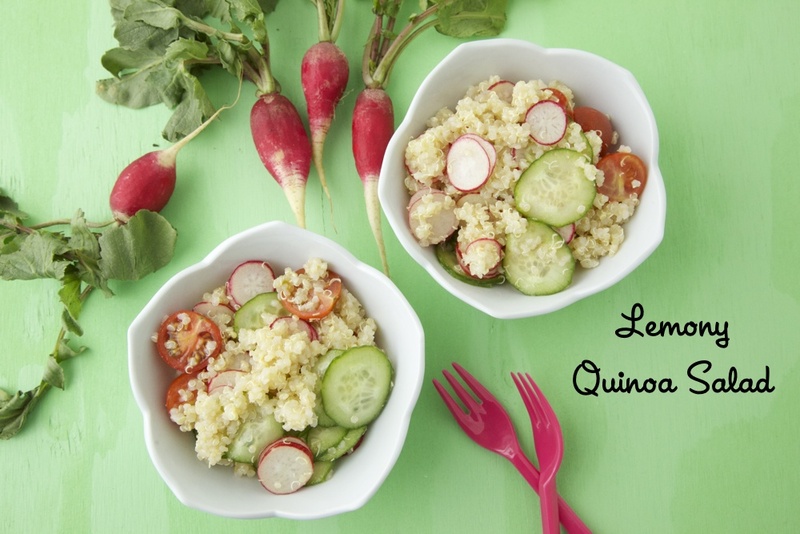 I have not tried Lemony Quinoa Salad but I like to eat salads so I guess I could try making it in the near future. What kind of dressing you put in the salad since I did not find any trace of mayonnaise or thousand island dressing? The olive oil, lemon juice, and salt act as the light dressing for this salad! Oh gosh Catherine- I have been thinking of you a lot. Just a few weeks to go! this salad looks fast and easy, but also delicious! Have made all of the other quinoa recipes in weelicious. They were all good! I was wondering how long cooked quinoa is good when refrigerated. Any response would be appreciated! Thanks! This salad will stay good for about 3 days in the fridge! I have some quinoa in the fridge and was just wondering what to do with a spare lemon before it goes bad... once again you read my mind! Thanks Catherine! Catherine, is there a type of Quinoa that you like; any brand? I get it from Trader Joe's! I love this!! Just like your husband my husband &amp; I are crazy busy (I'm prepping one home to sell) while my husband is working all day and then going to the home we bought as we are renovating it and I'm home with our 3 boys (2, 3, &amp; 8). Simple, fast &amp; healthy is what I need and desire. So happy I found your site and saw you on \"The Chew\". Such an inspiration to all us other crazy, busy, and health conscious moms! Thank you!! !